I’ve just read a review of Affecting Perception in Oxford Student Online which made good noises about the piece of work I had in the exhibition and though I’ve been in the art game for a few years now it still gives me a buzz when this happens. When the piece is so personal it’s even more satisfying when it resonates with others. I just hope the reviewer wasn’t looking through rose-tinted glasses. A friend recently contacted me saying that he had heard that wearing rose- tinted glasses can in fact help prevent or reduce the number of migraines and some research seems to indicate that it can be beneficial. Personally, if the demon light coming from an unexpected source hits me, I don’t usually have a chance of avoiding a migraine. 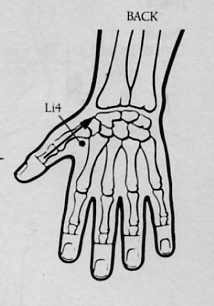 Occasionally, if I’m really quick, the length and intensity of the attack can be reduced by clamping on to acupressure point Li4, which is in the web between thumb and first finger. I do both hands for at least a minute each. If all artists who suffer from migraine wore rose tinted glasses when they were painting, drawing or whatever, they might well feel better but it might also make their art look better than it really is!